At last! 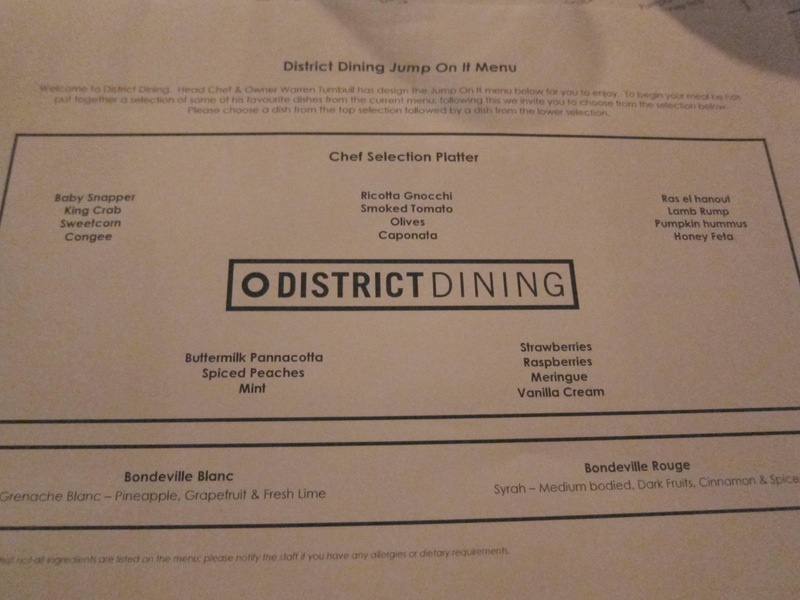 Our long awaited three-course dinner at District Dining had finally arrived. We were made welcome from the very beginning and, unlike some other JumpOnIt diners reported, we never felt that we were less important because we were using a voucher. 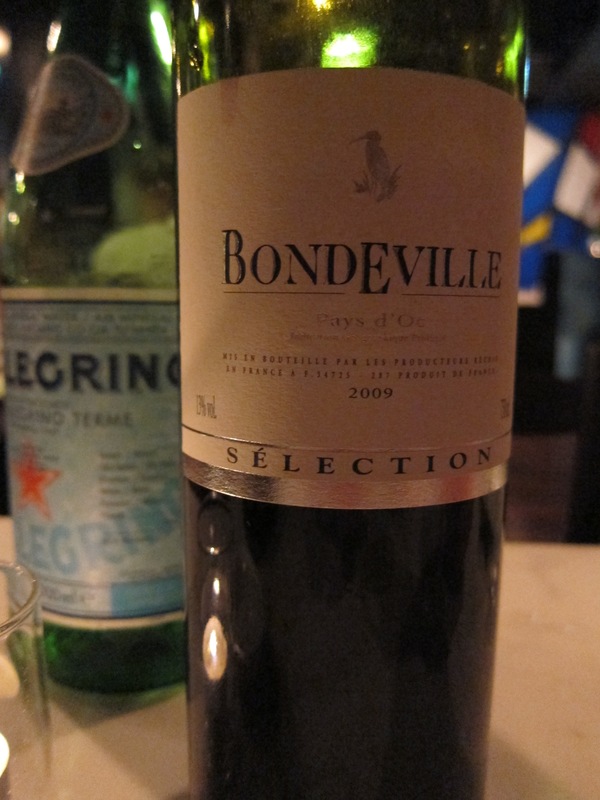 When offered our bottle of French wine with our meal, we chose the red syrah over the white grenache blanc. It was absolutely divine! I’m no wine connoisseur, but I’d describe it as light yet full of warming, almost Christmassy flavours. I adored it. There was a separate menu for voucher users, with a limited choice of mains and desserts; but what I really liked was that to start, we were brought a tasting “board” with four dishes: smoked eel pate with cucumber and dill; beetroot and white asparagus with salted yoghurt, sumac, and caramelised walnuts; veal tongue with salsa verde, pickled turnip and almonds, and deep-fried quail eggs with tarragon and anchovy mayonnaise. Much better than only having two to try between us! 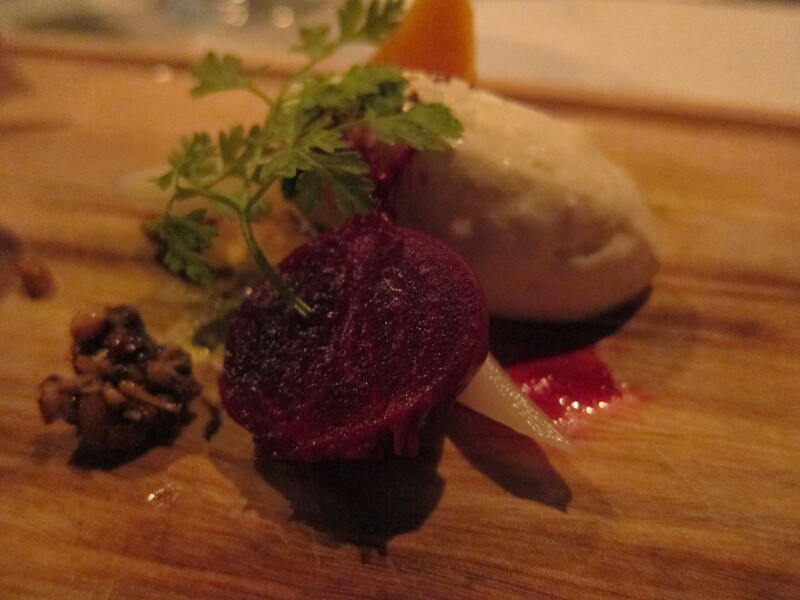 First we tried the beetroot and white asparagus – both beautifully cooked, this was a dish with perfectly balanced flavours and textures: earthiness and sweetness, a delicious tang from the rich, salted yoghurt and chewy, (very) caramelised walnuts to create a surprise contrast. Delish. 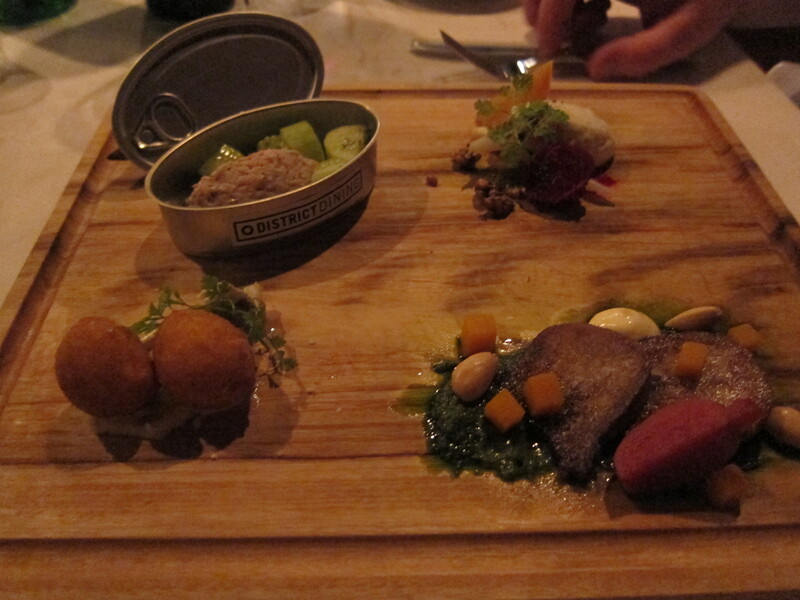 The smoked eel pate was nice, but not my cup of tea. 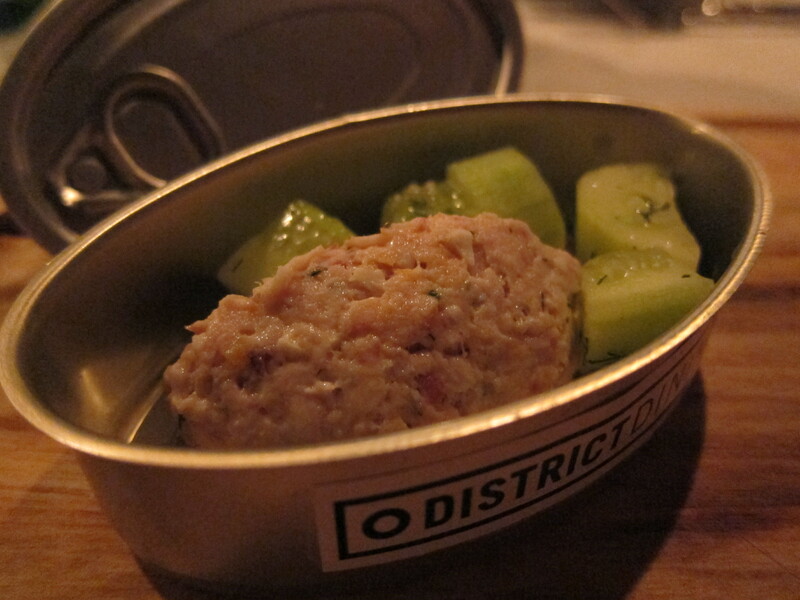 I’m also not a fan of cucumber or dill so this didn’t stand much of a chance with me! It was ok even by me though so that may mean it’s amazing… I don’t know! The tin was cute though! Tongue is not usually a form of offal which gets me drooling. 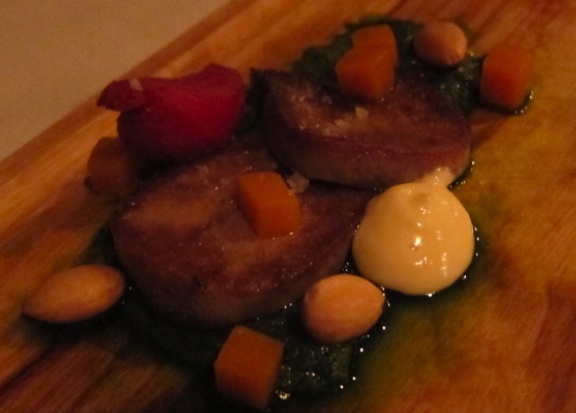 However, I’d drool at the thought of having District Dining’s veal tongue again. Oh! Ever so slightly crisp and browned on the edges, and so tender and delicate I could barely keep it on the fork. The salsa verde was piquant and fresh, perfectly offsetting the richness of the tongue, and the pickled turnip added textural interest. I found the almonds difficult to eat with the dish as they were whole but really, who cares? It was spectacular. And what was the mysterious, creamy dollop on the side? 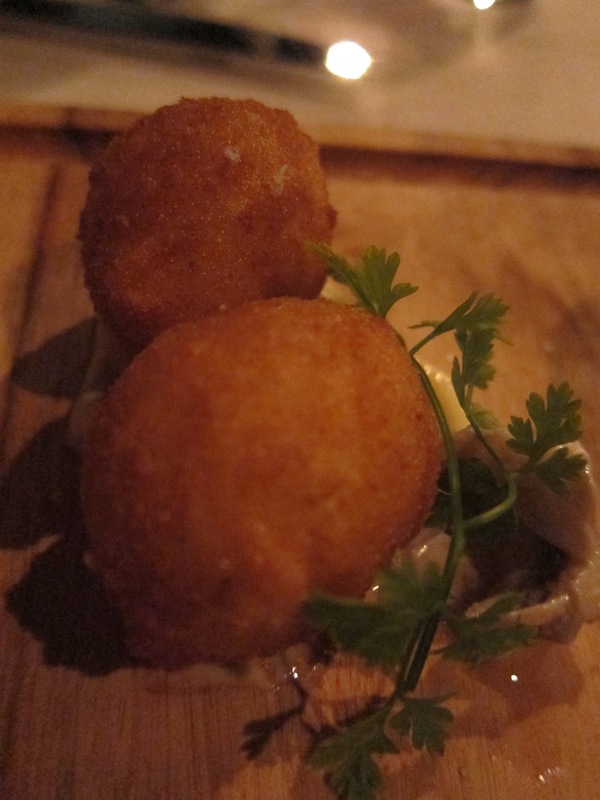 Lastly, the quail eggs. Crispy outside, quivery and ready to collapse on the inside. Anchovy mayonnaise. Need I say more? The lamb was gorgeous. 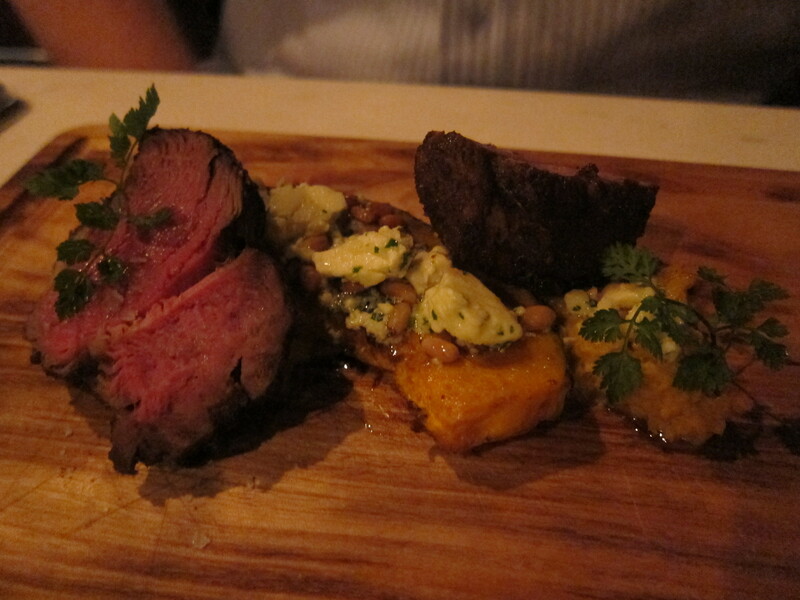 Again, perfectly balanced flavours of spice (ras el hanout), sweet (pumpkin and honey) and saltiness (feta) with the rich, meaty, slightly grassy lamb. Interestingly the two pieces of rump were quite different in texture; one very tender and easy to cut, the other slightly more chewy (probably due to a line of sinew through it) but both equally enjoyed by Mr Black. My gnocchi was light, tender and smothered in a delightful mix of herbs, olive oil, butter and caponata. The caponata was sweet and along with the salty bursts of olives and capers and toasty pine nuts made an absolutely heavenly dish. 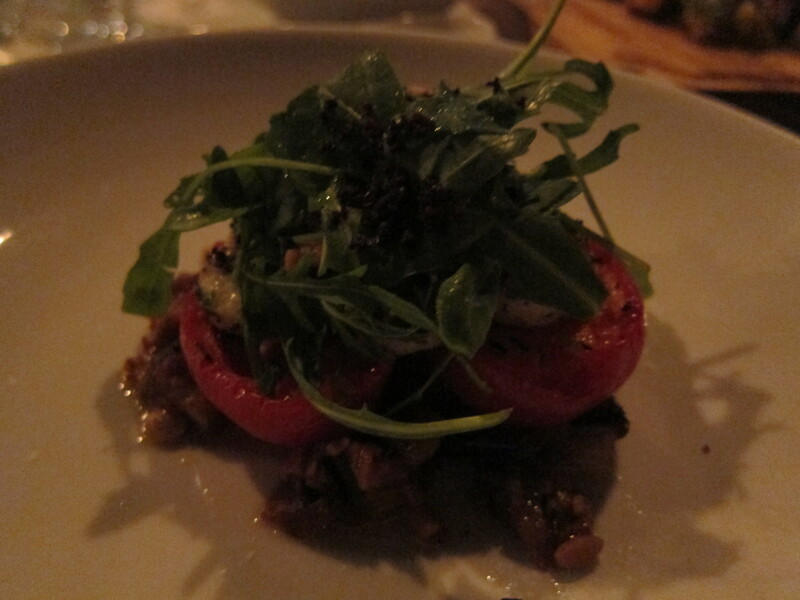 The tomatoes were sweet and juicy, but were they really smoked? Or again, perhaps more importantly, who cares??! We didn’t get too excited about desserts. The options were buttermilk pannacotta with spiced peaches or strawberries, raspberries, meringue and vanilla cream, and Mr Black isn’t into cream (mad!) I can’t eat cream, being lactose intolerant (sob!). We ordered one of each anyway to have a taste. It turns out that Mr Black did in fact manage to finish the Eton mess-like fruit, cream and meringue mixture, having declared it ‘very good actually’. I had a taste and heartily agreed. The berry sorbet atop lightened the richness beautifully. The spiced peaches, being dairy-free, were my treat. 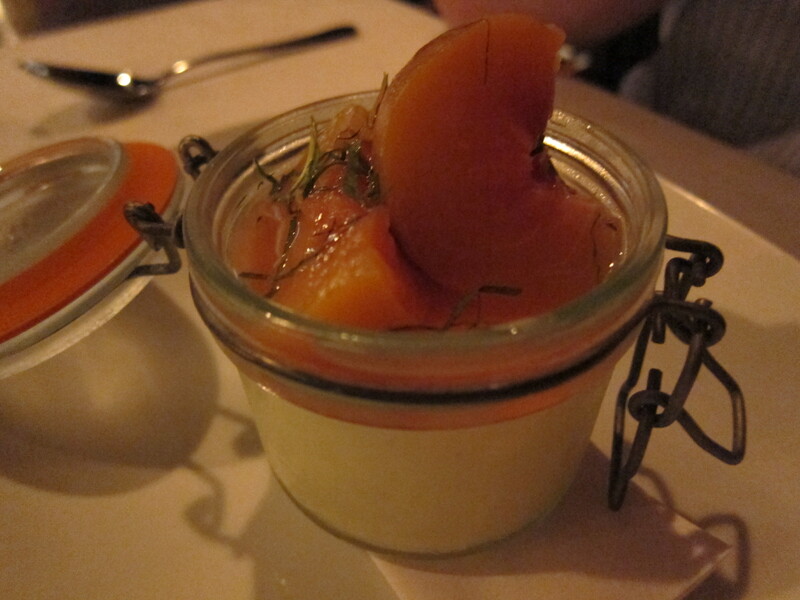 I loved the combination of delicate spices and mint with the syrupy peaches, and even dug down for a tast of the buttermilk pannacotta. Huge mistake – I didn’t want to stop! Too delicious for words. I can’t believe I managed to stop myself. Sigh! This is a unpretentious place to eat amazing food at reasonable prices. 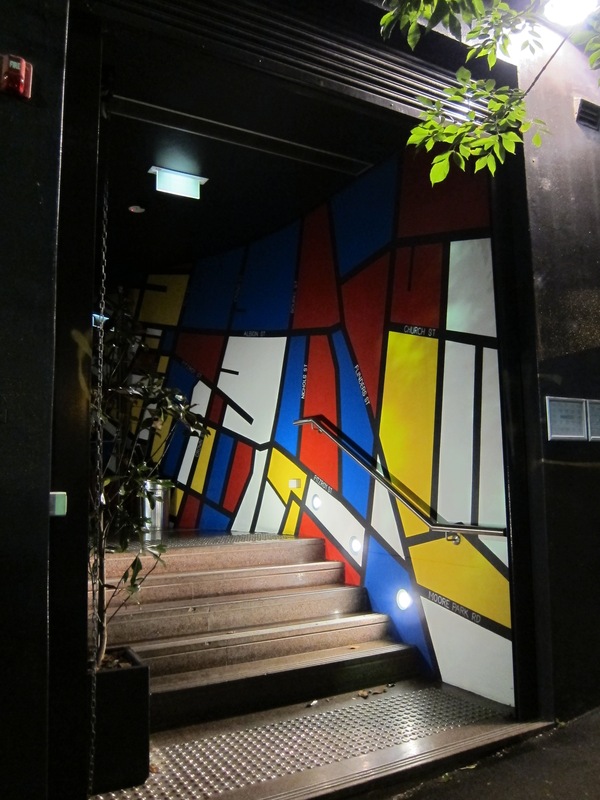 It’s the kind of place we’d consider dropping into for a dish or two to share before a night out in Surry Hills, or a more relaxed dinner with friends when we’re after a central location and a bit of a special atmosphere. If we can get a table that is! I see they changed the menu for the JumpOnIt offer. I went a couple of months ago and I thought the service was great even though I was using a voucher. I still have another voucher and am planning to go again soon. I absolutely loved the tasting plate minus the pate, not my cup of tea either. 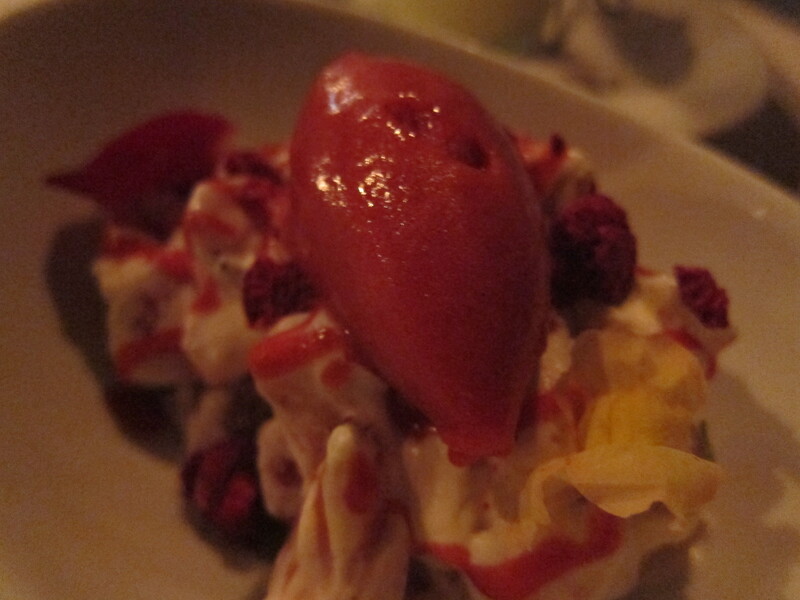 The lamb looked divine and I love the return of the ‘Eton Mess’! Joy! Hi Madam Wu, I actually went back last night with a large group so we got to try lots of new things – new post later today! The quail eggs look amazing, I’ll be sure to try them tonight when I go there!